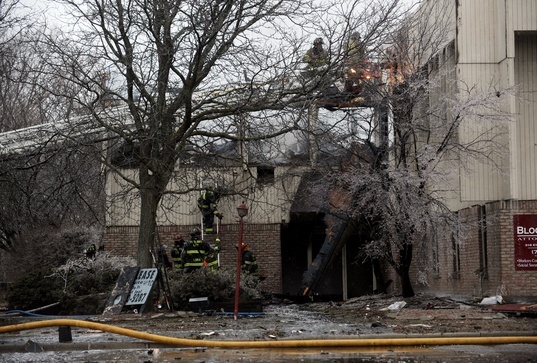 An early morning fire destroyed this office building at 316 Ecorse Road in Ypsilanti. Hours after a blaze destroyed a large office building in Ypsilanti, fire investigators are beginning the painstaking task of sifting through the rubble to search for clues. Because of the size of the building and the amount of collapse, heavy equipment is being used to pull apart what remains of 316 Ecorse Road, Ypsilanti Fire Capt. Dan Cain said. The two-story building - home to offices for attorneys, doctors, mortgage brokers and others - was gutted in the early morning fire. Cain said the blaze was already massive by the time firefighters arrived, due in part to the time of day and the fact that it was unoccupied on a Sunday morning. "By the time we got there, it was well advanced," Cain said. "The building is a total loss." One Ypsilanti firefighter was injured and is being evaluated at the hospital, Cain said. Water used to fight the fire also quickly froze on the ground, causing several firefighters to slip and fall, he said. It took firefighters nearly four hours to get the blaze under control. Cain said they'll be on the scene this afternoon dousing hot spots as the heavy equipment pulls apart the building. The fire started on the first floor, but the cause isn't yet known. A damage estimate also has not been calculated. The building is owned by New Dynamics Inc., and the taxpayer listed in county property records is Joel Grossman of Bloomfield Hills. Reached at his home this afternoon, Grossman confirmed he owns the building but declined to comment. Ecorse Road was closed for several hours, but reopened around 2 p.m.
Ypsilanti firefighters were assisted by firefighters from Ann Arbor, Ypsilanti Township, Superior Township and Pittsfield Township.